I am SO excited for this book!!! And that cover?? AHH! Please let it be March already! 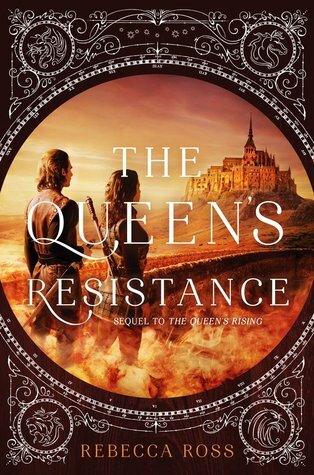 The plot of this book had an odd focus in my opinion, but I did enjoy that this was all about the next step immediately after a rebellion has won back the throne. This series is exploring the "true heir" trope in a unique way. I enjoy the world, the characters, and the writing. I love the focus on adoptive families. Audiobook review: The female narrator was good with voices but average with reading. The male narrator was poor with female voices but otherwise pretty good. Enjoyable enough in this The plot of this book had an odd focus in my opinion, but I did enjoy that this was all about the next step immediately after a rebellion has won back the throne. This series is exploring the "true heir" trope in a unique way. I enjoy the world, the characters, and the writing. I love the focus on adoptive families. This is a solid sequel. • The strong family and friendship themes are what makes this book worth reading. I like how it’s not just about the romance or about the political plot. Ross has done well in establishing the strength of each relationship. It makes me feel so much when I see characters be happy or sad for one another. I love how much Luc and Jourdain have become her family now – they are such lovable characters. Also, I appreciate seeing Brienna forming a stro This is a solid sequel. •	The strong family and friendship themes are what makes this book worth reading. I like how it’s not just about the romance or about the political plot. Ross has done well in establishing the strength of each relationship. It makes me feel so much when I see characters be happy or sad for one another. I love how much Luc and Jourdain have become her family now – they are such lovable characters. Also, I appreciate seeing Brienna forming a strong friendship with the queen. •	Cartier gets his own narration in this one and I enjoy it. His romance with Brienna is sweet and romantic. •	Brienna is frustrating at times with her secrecy (about her not being accepted as a MacQuinn and with the retaliation). I feel like it would’ve been smarter to voice her concerns, but I can understand why she’d be embarrassed to say them. •	Brienna definitely goes through a lotttt in this book – way more than the previous. I appreciate that she has gotten stronger. 3 stars. I like the 1st book better but this is a solid sequel and I have learned to really like certain characters. I’m honestly not sure where the next book will go. book focuses a lot on the vengeance and healing to gain closure from the dark era. I guess it’ll be nice to see a book of that rebuilding and moving forward. I had such high hopes for The Queen's Resistance. The first book in the duology, The Queen's Rising, was so intricately written and beautifully woven together to create such a unique world and captivating characters. It was because of my high hopes for this book that I was greatly let down in the end. I didn't feel the same spark (of interest) in this book like I did with TQR. Honestly, the characters felt in a way bland and disinteresting. They failed to capture my attention long enough to gene I had such high hopes for The Queen's Resistance. The first book in the duology, The Queen's Rising, was so intricately written and beautifully woven together to create such a unique world and captivating characters. It was because of my high hopes for this book that I was greatly let down in the end. I didn't feel the same spark (of interest) in this book like I did with TQR. Honestly, the characters felt in a way bland and disinteresting. They failed to capture my attention long enough to generally care about the overall scheme that was supposed to be unfolding within the plot. There was also a lack of mystery and suspense of what will occur next. With all that being said, it was still an overall okay book to read. I just couldn't find myself getting into the story. Who knows, maybe this is the perfect book for you. YAY!! I’m so excited!😱💜 How on earth did I not know about this? !